Tommy Wimmer asks someone to create an animutation. Only one man was brave enough to take up that challange, who designs it to Tommy's "style." At an astonishing 6fps, it breaks all forms of awesome. Plot: Andre 3000 beats up Jamie Cullum in the beginning. The Empire4 State Building flies to Washington, landing on Daunte Culpepper, who is crushed to death. Ilya kills Misteroo with an AK47. Reggie Bush's running back powers destroy George W. Bush. 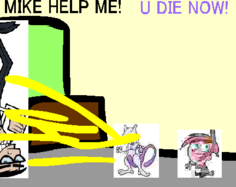 MMewtwo murders Mr. Crocker, who calls Timmyt Turner "Mike". Daavid Boston beats up Sirius Snape or whateever that muthafucka's name is. The thread containing the request and animutation. This page was last modified on 14 January 2010, at 00:04.